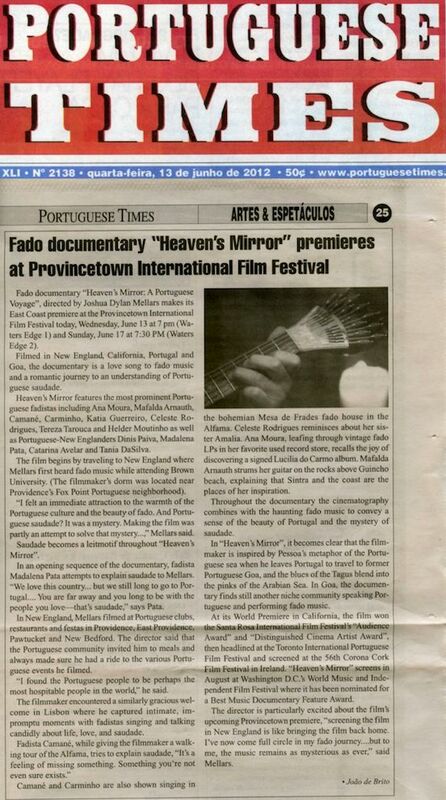 Fado documentary Heaven’s Mirror: A Portuguese Voyage, directed by Joshua Dylan Mellars makes its East Coast premiere at the Provincetown International Film Festival today, Wednesday, June 13 at 7 pm (Waters Edge 1) and Sunday, June 17 at 7:30 PM (Waters Edge 2). Filmed in New England, California, Portugal and Goa, the documentary is a love song to fado music and a romantic journey to an understanding of Portuguese saudade. Heaven’s Mirror features the most prominent Portuguese fadistas including Ana Moura, Mafalda Arnauth, Camané, Carminho, Katia Guerreiro, Celeste Rodrigues, Tereza Tarouca and Helder Moutinho as well as Portuguese-New Englanders Dinis Paiva, Madalena Pata, Catarina Avelar and Tania DaSilva. The film begins by traveling to New England where Mellars first heard fado music while attending Brown University. (The filmmaker’s dorm was located near Providence’s Fox Point Portuguese neighborhood). “I felt an immediate attraction to the warmth of the Portuguese culture and the beauty of fado. And Portuguese saudade? It was a mystery. Making the film was partly an attempt to solve that mystery,” Mellars said. Saudade becomes a leitmotif throughout Heaven’s Mirror. In an opening sequence of the documentary, fadista Madalena Pata attempts to explain saudade to Mellars. “We love this country… but we still long to go to Portugal…. You are far away and you long to be with the people you love—that’s saudade,” says Pata. In New England, Mellars filmed at Portuguese clubs, restaurants and festas in Providence, East Providence, Pawtucket and New Bedford. The director said that the Portuguese community invited him to meals and always made sure he had a ride to the various Portuguese events he filmed. “I found the Portuguese people to be perhaps the most hospitable people in the world,” he said. The filmmaker encountered a similarly gracious welcome in Lisbon where he captured intimate, impromptu moments with fadistas singing and talking candidly about life, love, and saudade. Camané and Carminho are also shown singing in the bohemian Mesa de Frades fado house in the Alfama. Celeste Rodrigues reminisces about her sister Amalia. Ana Moura, leafing through vintage fado LPs in her favorite used record store, recalls the joy of discovering a signed Lucilia do Carmo album. Mafalda Arnauth strums her guitar on the rocks above Guincho beach, explaining that Sintra and the coast are the places of her inspiration. Throughout the documentary the cinematography combines with the haunting fado music to convey a sense of the beauty of Portugal and the mystery of saudade. In Heaven’s Mirror, it becomes clear that the filmmaker is inspired by Pessoa’s metaphor of the Portuguese sea when he leaves Portugal to travel to former Portuguese Goa, and the blues of the Tagus blend into the pinks of the Arabian Sea. In Goa, the documentary finds still another niche community speaking Portuguese and performing fado music. At its World Premiere in California, the film won the Santa Rosa International Film Festival’s “Audience Award” and “Distinguished Cinema Artist Award,” then headlined at the Toronto International Portuguese Film Festival and screened at the 56th Corona Cork Film Festival in Ireland. “Heaven’s Mirror” screens in August at Washington D.C.’s World Music and Independent Film Festival where it has been nominated for a Best Music Documentary Feature Award. The director is particularly excited about the film’s upcoming Provincetown premiere, “screening the film in New England is like bringing the film back home. I’ve now come full circle in my fado journey….but to me, the music remains as mysterious as ever,” said Mellars.